Interferon-gamma Receptor 1 (CD119) human in vitro SimpleStep ELISA® (Enzyme-Linked Immunosorbent Assay) kit is designed for the accurate quantitative measurement of Interferon-gamma Receptor 1 protein in cell lysates and tissue extracts. Interferon gamma receptor 1 (IFNGR1) is a heterodimeric receptor that binds one interferon gamma dimer as a ligand. The receptor is a single-pass type I membrane protein present on the plasma membrane. A genetic variation in the IFNGR1 gene is associated with susceptibility to Helicobacter pylori infection. 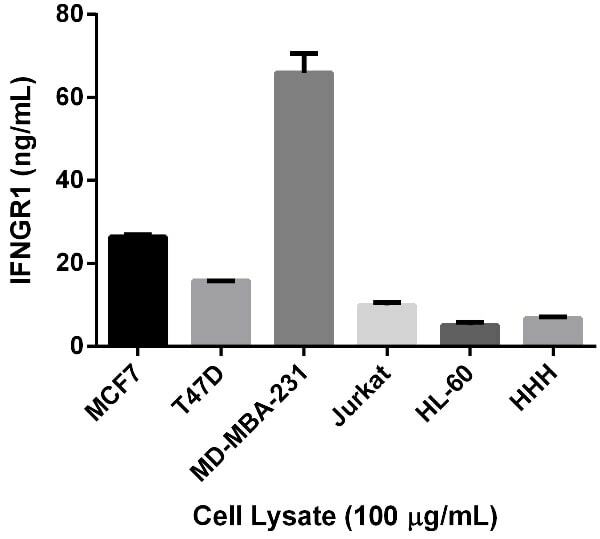 Defects in IFNGR1 are a cause of mendelian susceptibility to mycobacterial disease (MSMD); also known as familial disseminated atypical mycobacterial infection. This rare condition confers predisposition to illness caused by moderately virulent mycobacterial species, such as Bacillus Calmette-Guerin (BCG) vaccine and environmental non-tuberculous mycobacteria, and by the more virulent Mycobacterium tuberculosis. Our Abpromise guarantee covers the use of ab173193 in the following tested applications. Example IFNGR1 standard curve. Background-subtracted data values (mean +/- SD) are graphed. A new standard curve must be generated for each assay performed. 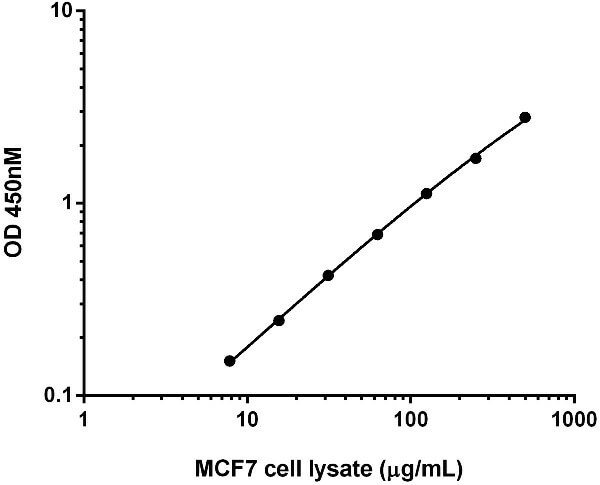 Titration of MCF7 cell lysate within the working range of the assay. Background subtracted data from triplicate measurements are plotted. Quantification of IFNGR1 expression in different mammalian cell lines. 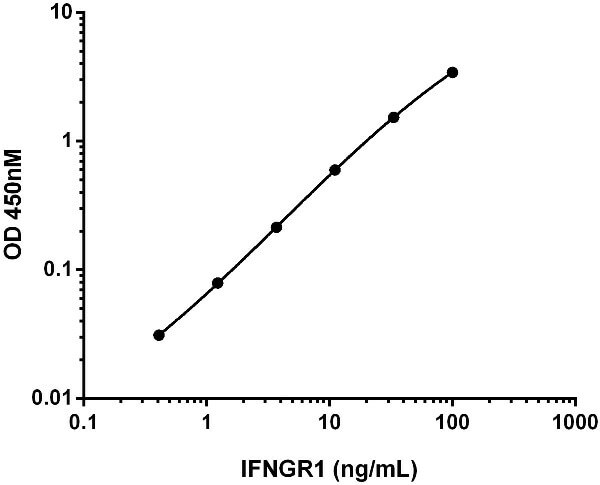 Interpolated values of IFNGR1 are plotted for the indicated cell lines based on a lysate concentration of 100 µg/mL. ab173193 has not yet been referenced specifically in any publications. Publishing research using ab173193? Please let us know so that we can cite the reference in this datasheet. There are currently no Customer reviews or Questions for ab173193.